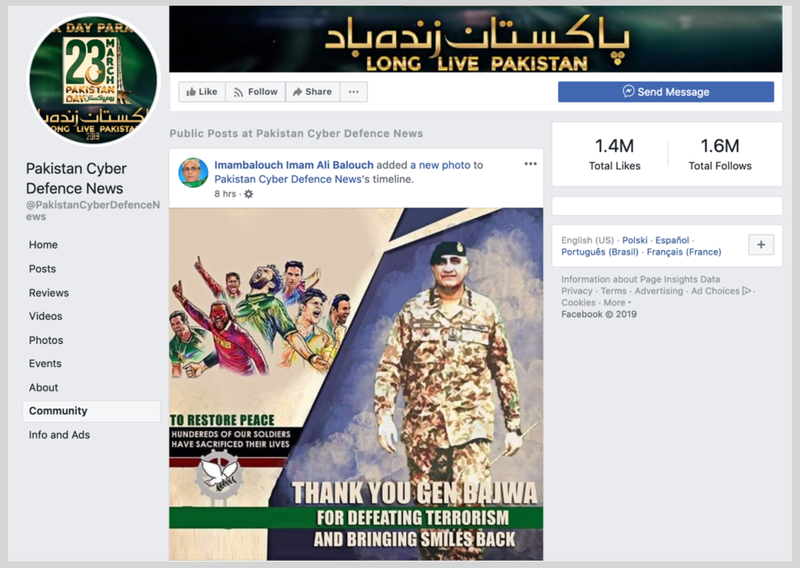 Individuals linked to the Pakistan Army’s public-relations division ran a network of covert Facebook and Instagram pages, which inflamed tensions over India, pushed Pakistan’s claims over Kashmir, and praised the army itself, until Facebook removed the pages on April 1. 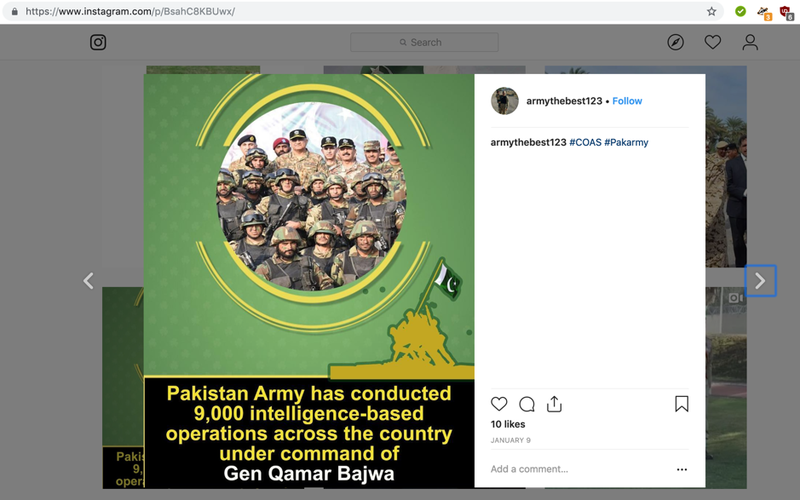 The network of more than 100 pages, accounts and groups represented a significant influence operation, apparently aimed at boosting support for the army inside Pakistan and boosting support for Pakistan abroad. 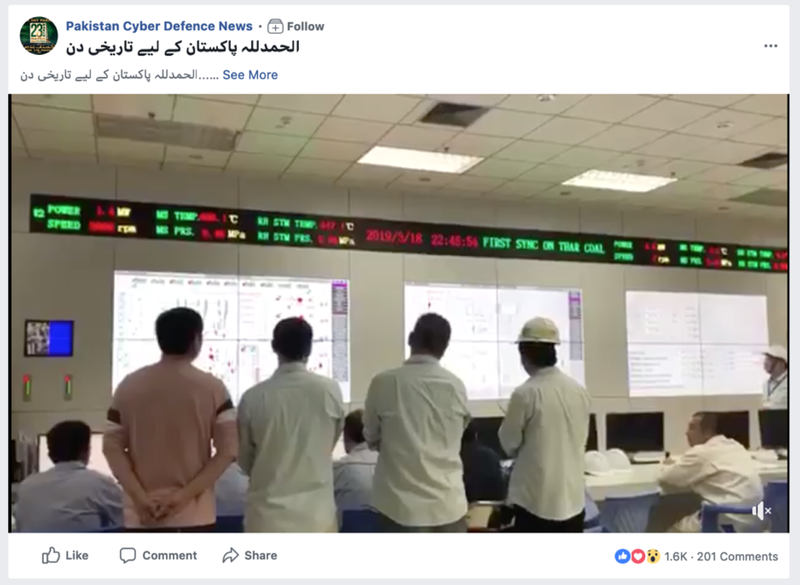 Facebook shared the names of the 103 pages, groups, and Instagram accounts with the DFRLab shortly before the takedown. They posted in Urdu and English. Some of the pages dated back over seven years; they boasted a combined total of more than 3 million followers by the time they were exposed, although the figure likely includes some degree of redundancy. 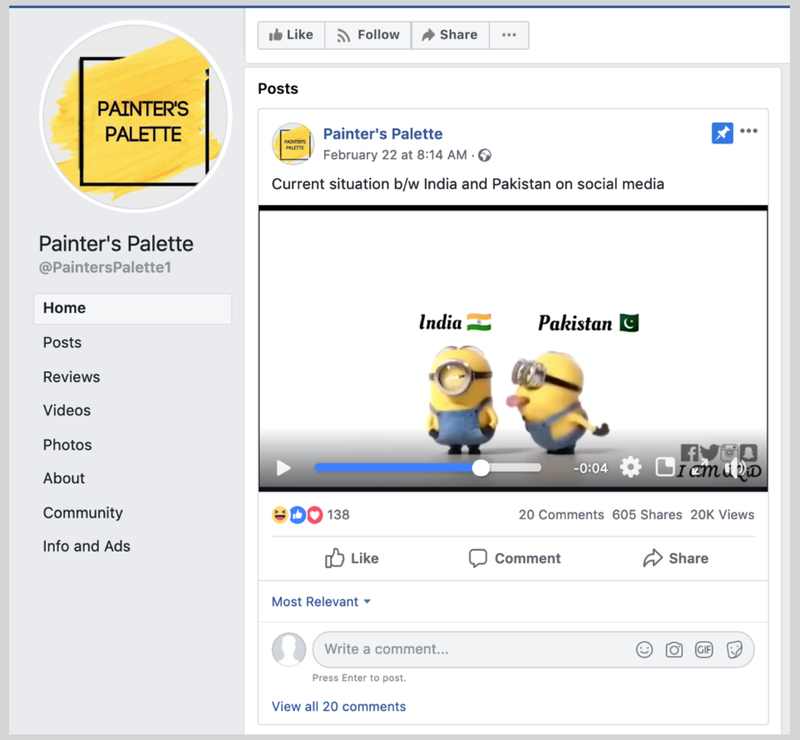 Although the people behind this activity attempted to conceal their identities, our investigation found that it was linked to employees of the ISPR (Inter-Service Public Relations) of the Pakistani military. 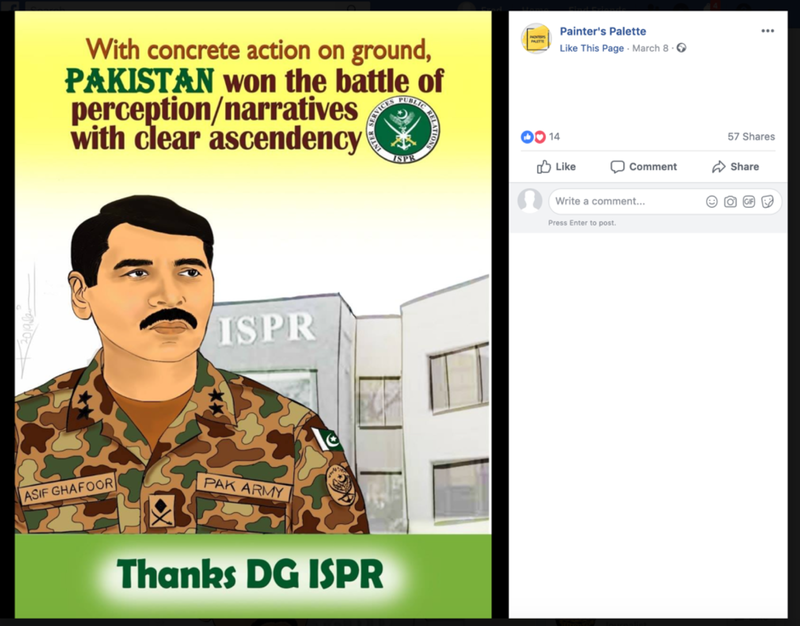 There was insufficient open-source evidence to fully prove that attribution, but the pages certainly pointed users towards Pakistan’s Inter-Services Public Relations service (ISPR), the military’s media wing, and its director general, Major General Asif Ghafoor. Their tone strongly supported Pakistan and attacked India, consistent with ISPR’s behavior. A number of other accounts also focused on the army’s successes, and its importance to the nation. The pages went beyond generic Army fandom and focused on the efforts of ISPR and Major General Ghafoor, in particular. 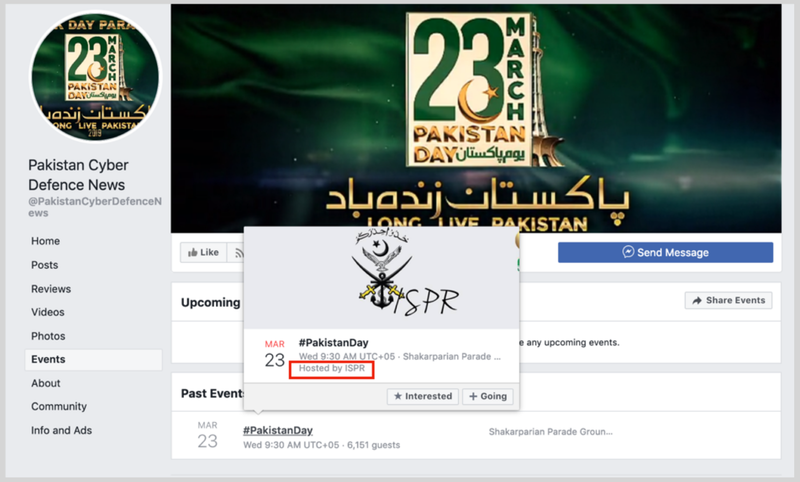 One page advertised an event which was organized by ISPR on Pakistan Day, March 23, 2018, indicating an interest in ISPR’s activity. And others mentioned Major General Ghafoor, in particular. 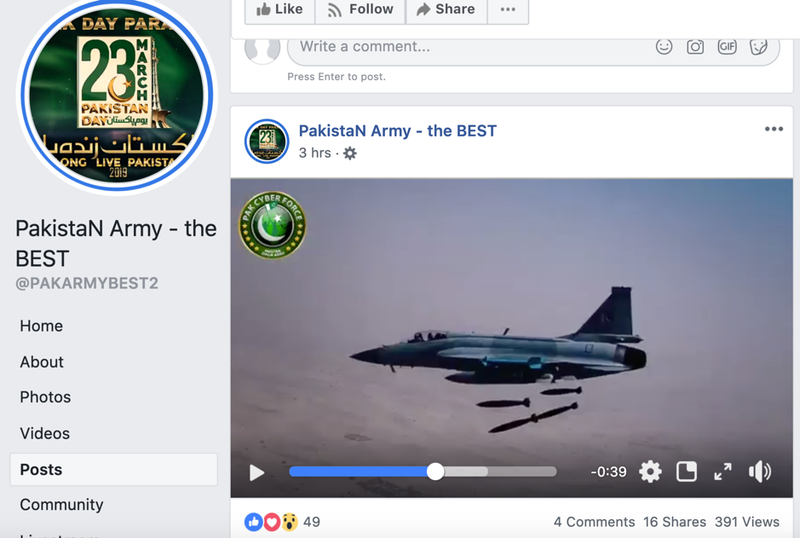 The focus on the armed forces’ PR unit, and its director, by multiple accounts in the network, is not enough to confirm Facebook’s attribution to ISPR affiliates, but it is certainly in line with that thesis. 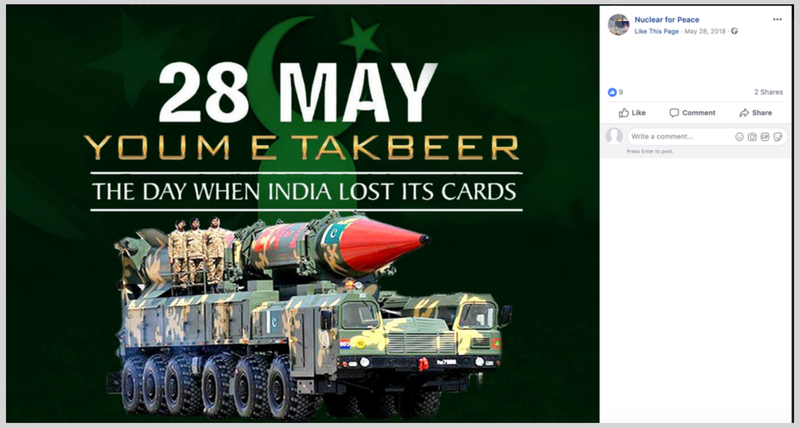 The pages were outspoken in their derision for India, especially after a suicide attacker from Indian-administered Kashmir killed 40 Indian police on February 14, and a Pakistan-based Islamist group claimed responsibility. India blamed Pakistan and launched air strikes into Pakistan on February 26; Pakistan denied responsibility, and the following day shot down an Indian fighter, capturing the pilot. 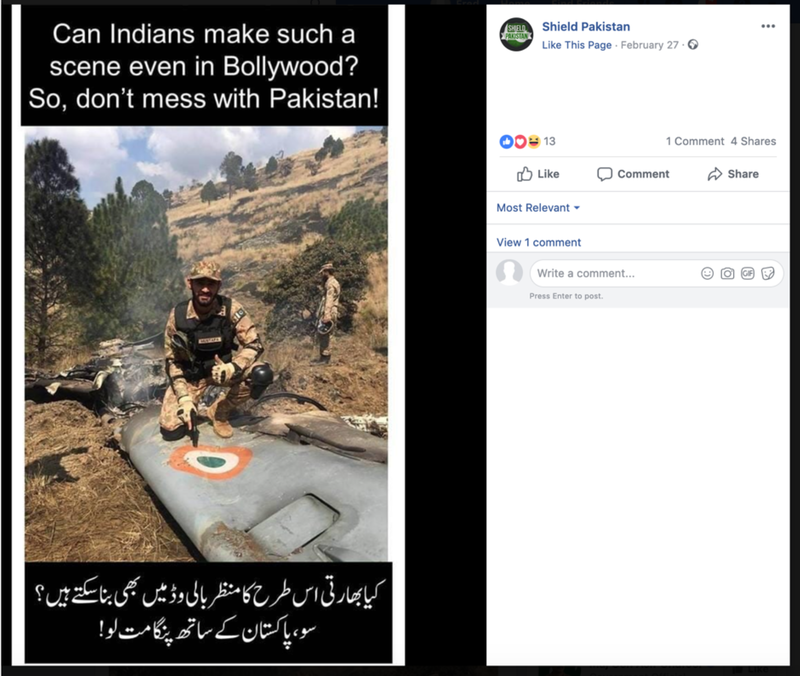 Some of the posts again focused on ISPR and Major General Ghafoor, using extreme rhetoric to stigmatize India and the Indian armed forces. 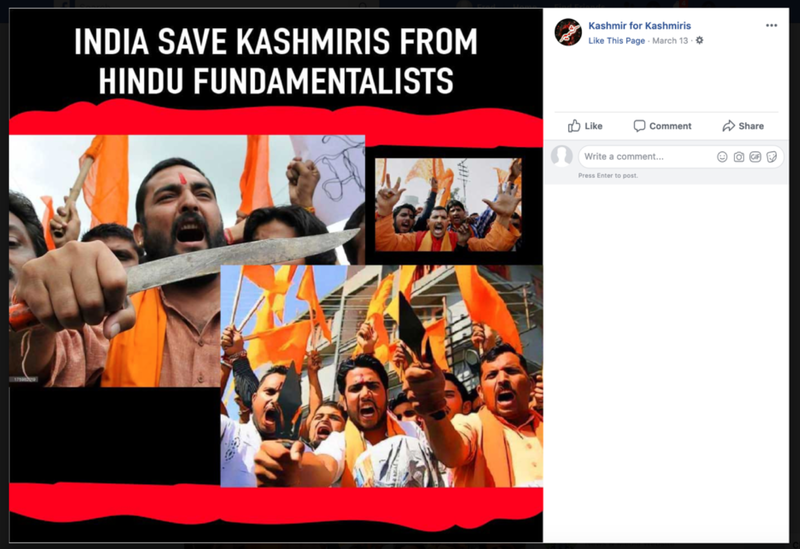 Some of the pages posed as Kashmiri activist groups, and demonized India, sometimes using memes clearly drawn from the same creative model. All told, the aggressively anti-Indian rhetoric, and the repeated references to Major General Ghafoor, are consistent with the Pakistan armed forces’ broader messaging, and with an interest in promoting ISPR specifically. Other posts were positive about Pakistan more broadly, not only the army. 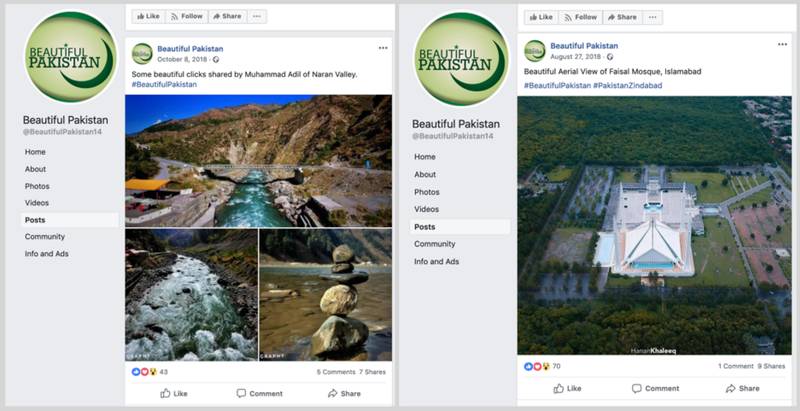 One Facebook page with 103,000 followers, “Beautiful Pakistan,” as the name suggests, largely focused on Pakistan’s natural and architectural beauty. 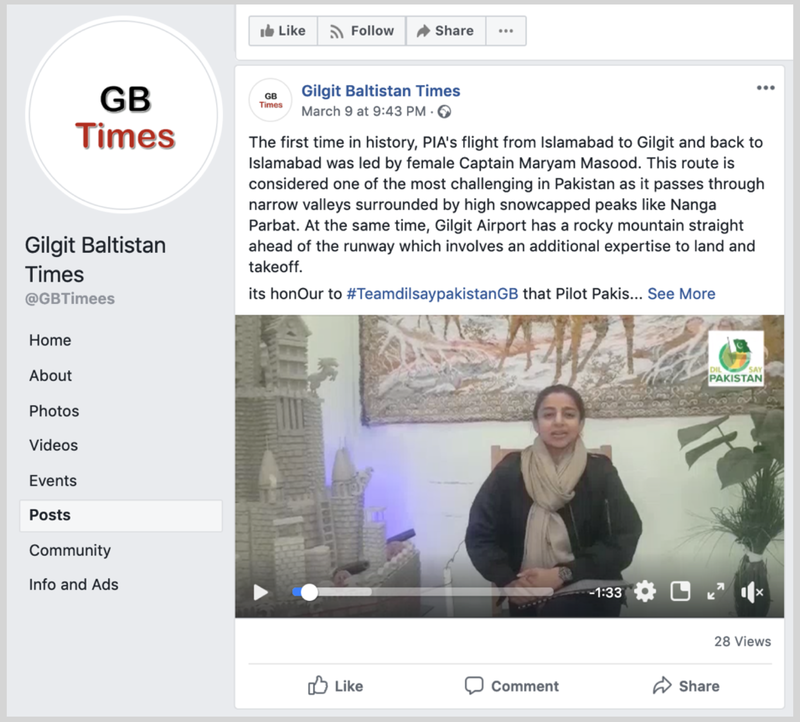 Another, posing as a news outlet in the northern area of Gilgit Baltistan, posted on local topics of interest and pride, such as the first flight to Islamabad piloted by a woman. Gilgit Baltistan occupies a geopolitically sensitive position, as it borders the conflict zone of Kashmir, Afghanistan, and China’s restive province of Xinjiang, the site of a large-scale reported crackdown on the Muslim Uighur population. 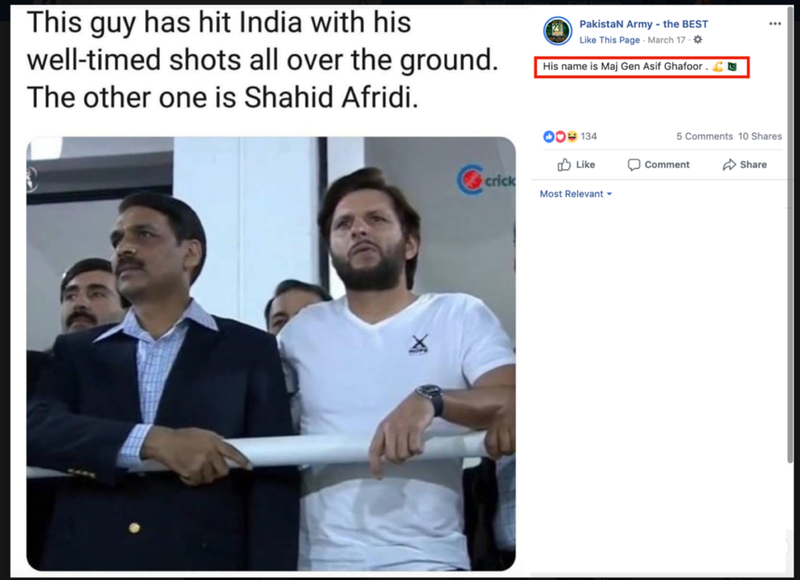 In between their posts, such accounts also posted more directly patriotic content, including content praising the army. This patriotic content was in the minority, however. The pages’ audience numbers were, in some cases, impressive. 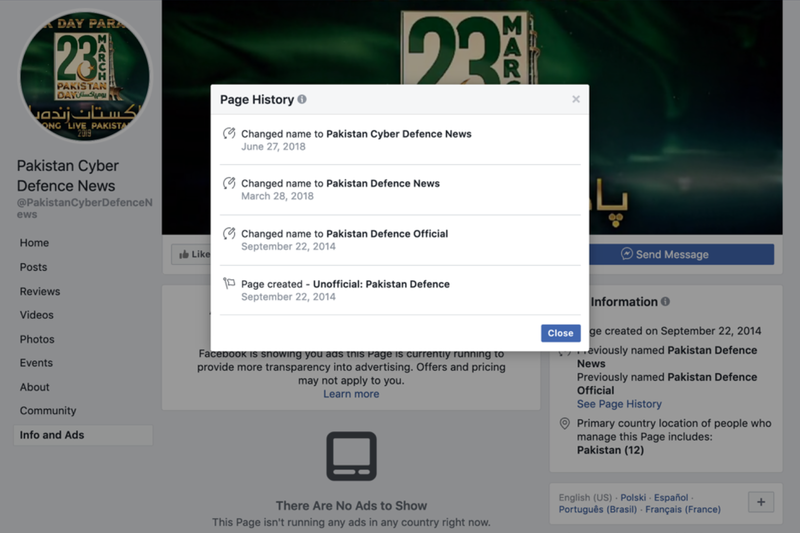 The best-performing page was “Pakistan Cyber Defence News,” which registered over 1.6 million followers. 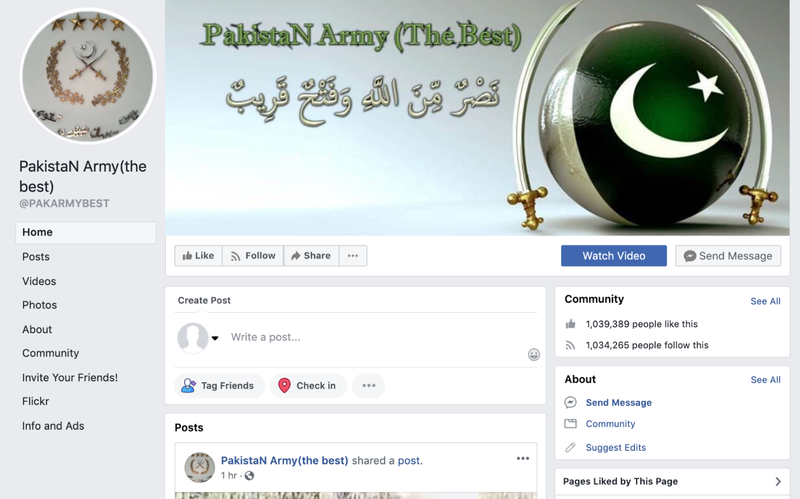 The PAKARMYBEST page referenced above counted over 1 million followers. Other pages in the network also amassed tens or hundreds of thousands of followers over many years. 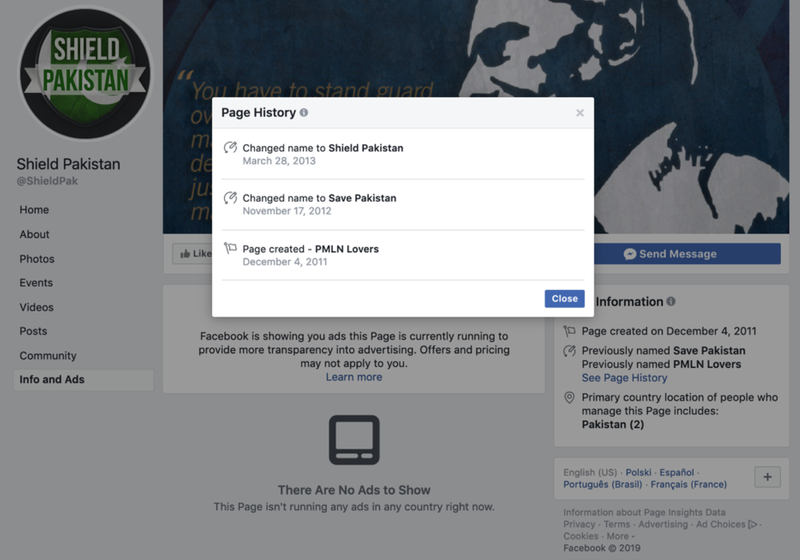 One of the oldest, “Shield Pakistan,” created in 2011, had 60,790 followers by the time it was taken down. Curiously, it was briefly named for a political party, the Pakistan Muslim League — Nawaz (PMLN) before adopting a more generic tone. In other posts, the page was true to the tone of the broader network. 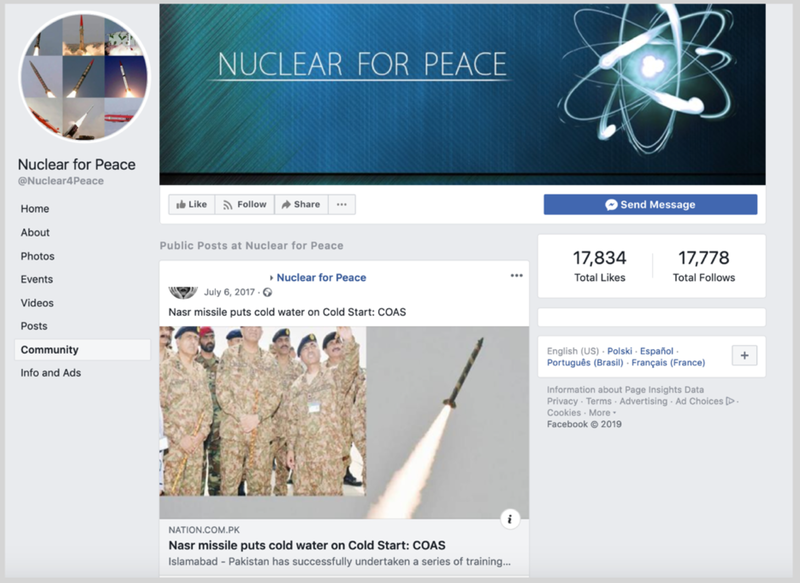 An even earlier page, “Nuclear for Peace,” created on December 10, 2013, praised Pakistan’s nuclear program, which it described as peaceful, but largely focused on its nuclear weapons. This page had a relatively modest 17,000 followers. However, this page last posted in May 2018, suggesting that it had been abandoned by its operators, perhaps in favor of assets which were judged to be more effective. The network consisted of six groups, as well as the Facebook and Instagram accounts. Four were taken down before the DFRLab could view them, and the other two were locked, leaving almost no data for research. 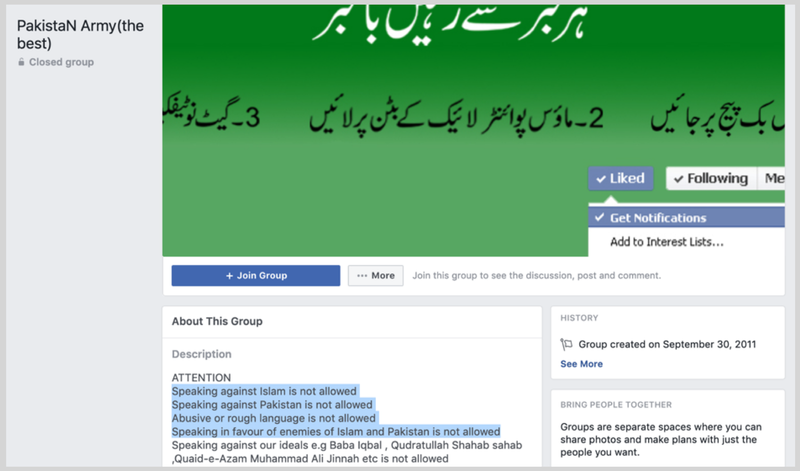 The rules of one of the groups, “PakistaN Army the Best,” with the same typo as the page mentioned above, and also created in 2011, insisted that “speaking in favour of enemies of Islam and Pakistan is not allowed,” leaving its loyalties and antipathies clear. The pages amassed a considerable following — over 3 million, across all the assets. However, this is only one measure of impact. Many of the individual posts only received a few reactions, measured in likes or shares. This post on Kashmir, for example, had none. This post on energy cooperation with China had 1,600, a more substantial figure, but only 0.1 percent of the 1.6 million accounts which followed the page. Posts on this page typically scored in the low hundreds or low thousands of reactions. The follower numbers should not, therefore, be over-interpreted. Some of the accounts gained a considerable following, and did generate some reaction; overall, however, the operation had mixed success, with some pages gaining very little traction at all. 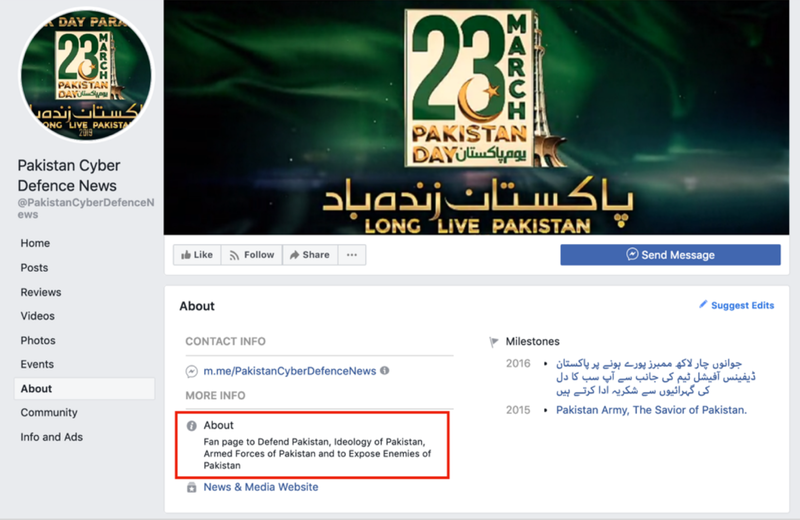 Facebook attributed the pages to ISPR employees. 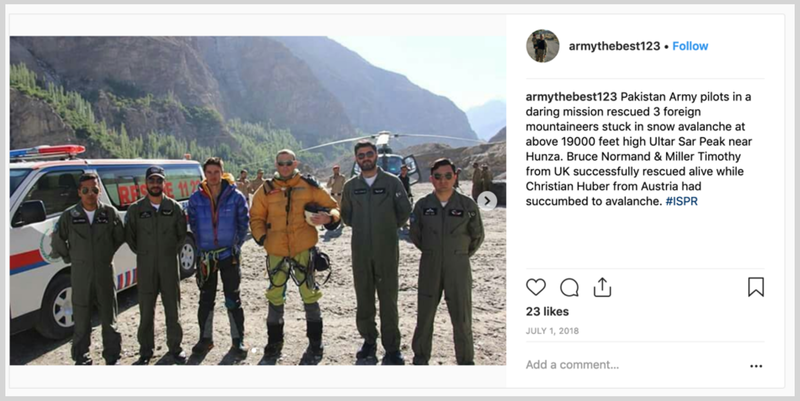 There was insufficient open-source evidence to fully confirm that attribution, but the behavior of the pages in question was wholly in keeping with a military PR agency. The focus on ISPR’s director general was particularly striking in this regard. The pages and groups very largely followed Pakistan’s strategic narratives: the strength of the Army, India’s weakness and wickedness, national pride, and the claim over all of Kashmir. Most pages and groups promoted these narratives directly; a few were indirect, referencing them between more innocuous posts. The network is noteworthy for its size, age, and context. Some of the accounts dated back to 2010 and 2011; a couple had hundreds of thousands of followers. Most importantly, they were vocal amplifiers of Pakistan’s narrative during the February showdown between South Asia’s nuclear powers. That narrative was polemic, aggressive, and highly divisive. As such, it contributed to further inflaming regional sentiment between the two nuclear powers. Ben Nimmo is Senior Fellow for Information Defense at the Atlantic Council’s Digital Forensic Research Lab. Kanishk Karan is a Digital Forensic Research Associate at the DFRLab.